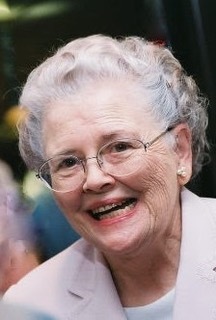 Elizabeth Platt Johnson passed away January 13, 2019 surrounded by loving family and friends. “Lib” moved to Gainesville in 1936 when her father, James Platt, Sr., became head of Chicopee Mill. Born in 1918 in Cumberland SC, she and her siblings, James Platt, Harold Platt and Louise Platt Bloom, grew up as children of the manager of multiple textile mills before settling in Gainesville. She lived through the Great Depression, earning as much as 5 cents for catching and preparing chickens for family dinner. In Gainesville, the young Shorter College freshman rode horses through Brenau Woods, met her future husband William Hammond Johnson, Jr. “Ham”, and eventually became part of Gainesville history. Graduating college as salutatorian, she taught 4th grade at Main Street School while her fiancé Ham finished UGA law school. They married in 1941 and Lib sent Ham off to WWII to serve in the Pacific Naval Fleet. With their first child Bonnie Sue, she followed his ship from Portsmouth, VA to Miami, FL and at war’s end, William Hammond Johnson, III (Skip) was born in 1945. The family settled at 407 Brenau Avenue where Lib kept track of the fleet of children running from back yard to back yard. Always community oriented, Lib was dedicated to First Methodist Church, Candler Street PTA, Junior League, Girl and Cub Scouts, The Book Club, Garden Club, and the “NEW” Chattahoochee Country Club. She cherished family events with Jim and Bonnie Kate Platt, Hammond and Sue Johnson, Harold and Anne Palmour Platt, Mrs. Annie Palmour, Fletcher M Johnson and Lucy Keene Johnson. 1955 was an auspicious year as Lake Lanier began filling, the home on Dixon Drive was built, and Elizabeth Louise (Liz) was born! Lib adored little ones and was again blessed with preschool, kindergarten, birthday parties and life on the waters of Lake Lanier. The family grew to sons-in-law Bill Fritz and Bob Irby, grandchildren Rebecca Sheldon, Sharon and Tristan Fritz, and great grandchildren Kaity, Fana, Leyu, and Tristan, Jr.
On March 25, 2018 Lib celebrated her 100th birthday with 100 of her closest family and friends. A kind soul who always had a compliment to bestow and a shoulder to lean on, she left us peacefully with many memories, much love, and a life to live by as she joins her parents and siblings to talk about, as she recently exclaimed - Us! Graveside services will be held Sunday, January 20, at 1:30 p.m. in Alta Vista Cemetery, followed by a Celebration of Life service, Gainesville First United Methodist Church at 3 p.m. Reverend Carolyn Clifton will officiate. A reception will follow at the church.